If you are ever in Modena, Italy, you may see a big blond kid tearing down the street on a Lambretta scooter with a big, mean-looking German shepherd on board. That will be Tom Meade going about his business with his very ferocious dog along for the ride. Both are familiar figures in a town where there are few foreigners and Meade is one of the oldest of them in terms of residence. Tom Meade went to Italy literally in pursuit of a dream. So have a lot of others; so what makes Meade different? First the dream. Even before his four-year hitch in the U.S. Navy, young Tom— he's only 31 now— had "the dream of someday owning an exotic car!" Tom was born in Hollywood, California, and though some of his school years were spent in Australia and Hawaii, he considers himself to be a Californian. With his goal in mind, Tom saved much of his military pay from service, which included duty as an electronics technician aboard the carriers Oriskany and Yorktown in the Pacific. When he got out of the Navy in 1960 and returned home to Newport Beach, he started looking around for "the" car. He also started experimenting with fiberglass as a restyling medium. What really lit the fuse was the appearance in town of a Ferrari Testa Rossa. "I fell in love with it and spent hours just looking at it." That was the dream—a car like the Testa Rossa. Next, the pursuit. A friend told him that the owner of the Ferrari had found it in Rome where, Tom was assured, there was a warehouse filled with similar machines. Wow! Tom's Navy pay wasn't going to stretch for the Stateside price of such an automobile, so what to do? He decided to get to Rome somehow. Socking away his hard-earned money, Tom hitched his way down to New Orleans to find a Europe-bound ship. This wasn't so easy to do, but eventually he hired on as a mess boy on a Norwegian grain freighter. Some 35 days later, he landed in Stavanger in his lightweight California slacks and jacket and slowly shivered and thumbed his way east to Oslo and Stockholm, south to London, then to France and Spain. From Majorca, he earned his passage on a yacht over to Genoa. One of his first stops was at a youth hostel where he met a young New Zealander who had just discarded a BSA motorcycle as unusable. Tom was told he could have it—it was done for. Tom took it to a nearby service station, fixed it, and was soon on his way down to Rome and the fabulous warehouse filled with Ferraris and Maseratis. During his search, he heard of a movie company that had an old racing Ferrari as a prop car. As he wasn't getting anywhere finding the warehouse, he decided to look up the film company. The car was no more but he met Dino de Laurentiis, who was filming The Best of Enemies, and got a job as an extra. This provided some welcome income and also left him plenty of time for his search. Disappointed at not having seen even one Ferrari or Maserati competition car, Tom decided to at least try to visit those two factories before quitting Italy. He arrived in Modena one afternoon on his BSA, tired, dusty, and bearded (the latter a leftover from the movie bit). He asked where the Ferrari and Maserati plants were and was told that Ferrari was about 15 kilometers away but that Maserati was right around the corner. Tired, Tom opted for a try at the latter before calling it a day. Despite his travel-worn ap­pearance, he gained admittance at Maserati and was met by Ingegnere Aurelio Bertocchi. Asked if there were any used racing sports cars for sale, Bertocchi replied no, at least not in Tom's price range. However, he did kindly consent to show the obviously keen young American around, even making an exception concerning the competition department (those were the days of the Tipo 60 and Tipo 61 "Bird­cages"). Off to one side, Tom later noticed an interesting shape under an old tarpaulin. He was told it was of no interest, "Vecchia—Old!" But Tom insisted and began to uncover the car. "I used to only look at the nose and the tail of a car," he said, but as this car came to light, it kept getting better. It looked good all over. Tom described it as "the wildest-looking car I'd ever seen!" It was a 350 SI body and chassis— no engine, gearbox, differential, or steering. No matter, Tom had to have it. He was told it wasn't for sale, but he badgered Ing. Bertocchi till the latter finally picked up a phone and checked with the front office and then took out his slide rule and did a sum. The price in lire— at the time Tom had little knowledge of the language or ex­change—just about floored him until Bertocchi revived him with a dollar price—about $400. Relieved, Tom didn't let on and eventually got it for a bit less. He paid for it and then had to have it right away; he didn't want them to change their minds. A truck was provided, and the car was loaded (by now he was beginning to realize that they were happy with the deal too) and he was asked, "Where to?" Oh! Bertocchi suggested a garage in the Villagio Artigiano (Artisan's Village) section of town. There, the car was put on sawhorses, and Tom given permission to stretch his sleeping bag out on the floor and call it a day. The big problem, of course, was what to do for an engine. This was solved soon after. One day while at Maserati, he met the late Lloyd "Lucky" Casner who had been campaigning a Corvette in Europe, as well as "Birdcage" Maseratis. The Corvette had been written off in a road accident and Casner's Team Camoradi had an extra Chevrolet engine for sale, which Tom bought. Not long after, on another part-hunting trip up north, Tom met a farmer near Vicenza, who invited him to visit his farm. Tom looked at the barn and thought what a keen place it would be for building his car, and of course, the haymow would be just right for summer sleeping quarters. The farmer was agreeable, and Tom paid his board helping out on the place. The Maserati and Corvette engine were wed in this rural setting and trucked back to Modena for the bodywork before winter set in. The primary bodywork was done by Gentilini, which at the time was also building Maserati competition bodies. 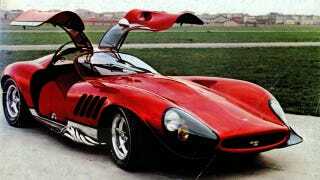 The car was finished at Fantuzzi's carrozzeria, Fantuzzi having built the body originally. Here again Tom solved the lodging problem by sleeping at the shop. The final touch was an original removable hardtop for the Maserati-Corvette. Finished early in 1962, the car was shipped from Geneva to San Francisco. In San Francisco he and his mother, Day Meade, opened up an import bazaar and that seemed the end of Tom's European adventure. Then one day, a couple of friends took the car out to have some work done on the engine. They went off a cliff and put the car into a Marin County treetop. Luckily his friends weren't hurt, but the car was pretty bad. Tom later sold it for $2700, which was what he had in it, not counting time, of course. Figuring he'd never be able to afford another car like that, he began to get itchy to go back to Italy for another go at the special building, this time on a more businesslike basis. He wasn't all that satisfied with San Francisco anyway, not being in daily contact with automobiles. So in 1963, he took an Icelandic Airlines flight back to Europe and located again in Modena. He rented an apartment and small garage in the Villagio Artigiano and reestablished contact with Maserati. He acquired a 200S with engine and a 350S without engine. He modified the 200S body and made the car streetworthy. The car was sent to a "customer" in the States who never paid for it. The 350S was sold to a friend, Cal Moss, and Tom was paid for this effort, which included putting in a 283 Chevro­let V8 coupled to a Ferrari Mondial five-speed transaxle. His next venture was the first car he built with a body com­pletely of his own design. It was a coupe built on a Ferrari 250 GT chassis and using 250 GT engine and running parts. The car was hardly finished in the fall of 1964, when disaster struck again. The car was caught in and ruined by the heavy floods, which are best remembered for the Florence calamity but which also did much damage in the Modena area. Not surprisingly, things were getting pretty thin, so when a Dutch automobile dealer and enthusiast invited him to Holland to redesign the body on a Tipo 61 Maserati, Tom accepted. As this project was being finished, Tom ran out of money. On his way back to Italy, he went to Brussels. An imported-car dealer there, M. Leon Barbie, said he had a client who was interested in a Maserati Tipo 63 (the rear-engined "Birdcage") and did Tom know where one suitable for conversion might be located? Did he! One of the items he had bought from Maserati's "graveyard" had been a T63 chassis, and it was one of the things he had saved in Modena when he left. It was in his garage (if he still had a garage) but, he explained, the chassis needed an engine, rent was due on the garage and . . . "And then," Tom says, "M. Barbie pulled out a check, made it out, signed it, and there was my salvation." The Tipo 63 was rebuilt using a two-liter Tipo 60 four-cylinder instead of the rare original twelve. Tom not only gained a customer but also valuable future contacts from this transaction. It was the encouragement he needed to continue, and he's kept on since then, having built numerous specials with more in the works. These cars have been primarily boulevard GT cars rather than competition machines, though in general their styling has probably contributed to performance. One of his special projects was a car built in 1967 for Harry Windsor, a California enthusiast. Windsor wanted a rear-engined special with a body inspired by Ferrari P4 styling. The details were left to Tom, who started by modifying a Cooper single-seater chassis and using a 250 GT Ferrari V12 coupled to a ZF gearbox. This car was the first of several to be named "Thomassima." It has been shown on the West Coast, where it has attracted considerable attention. As this is being writ­ten Tom has received a tentative order for three similar cars, using either Ferrari or Lamborghini engines, for an­other interested American client. After the rear-engine car two more "Thomassimas" have been built, both front-engined. One is a Chevrolet-V8-powered GT coupe, which Tom refers to rather anachro­nistically as an "anti-Cobra." The other GT, which appears on the cover and in most of the accompanying photos, is powered by a three-liter Ferrari and is a very low gullwing coupe. Tom considers this to be his capolavoro to date, though he prefers a mid-engined configuration. This latest car has been over a year in building, with an emphasis on finish, and among its features are roof switches, exposed convoluted exhaust headers along the flanks as well as Meade-manufactured accessories like the cast steering wheel and the long-eared knockoff hub nuts. Tom has used this car for promotional purposes at shows in Italy and has received quite a lot of publicity. Now that delivery to its U.S. customer is about due he's planning a "superluxurious" personal car— mid-positioned V12, power steering, air, stereo, "superwide" wheels, the lot. Other projects are also on the way but are still on the classified list. Meanwhile, Tom's basic income has always been from used cars, usually of the Ferrari, Lamborghini, Maserati, variety, and he is probably better known for this in America than as a special builder. He has an unquestioned ability to find hard-to-get, desirable, "exotic" automobiles. He is also set up to prepare and, if specified, modify these cars for his customers prior to delivery. In addition to knowing where to look for rare cars and parts, he often gets hot tips before something is advertised for sale. Helping with the secretarial chores is his mother, who finally gave in to her son's passion for automobiles and joined him in Modena a couple of years ago. One suspects that she supplies some good business savvy as well. Superlatives keep slipping into Tom 's conversation when he talks about his cars and plans—Fantastic! Wild! Fabulous! But the enthusiasm is genuine, and so is the energy. Setbacks don't seem to get him down for long. A couple of years ago, Carroll Shelby was talking with him about setting up a small plant in Modena for a series of mid-engined GTs. Then Ford took over the Cobra name, and later Shelby got out of the automobile-building business. It was a tantalizing might-have-been but Tom doesn't dwell upon it. It's the kind of backing he'd like, and it could still happen. In the meantime, he has just acquired a new shop with 3000 square feet of floor space. This new plant is located near his old place and is just opposite the Modena Autodrome. It will be called Tom Meade's Used Sports Car Center of Italy. As the title suggests, a main activity will be the buying and selling of used Italian GT cars. The center will also specialize in helping foreign owners of Italian GT and sport cars obtain spare parts, and as many parts as possible will be stocked with the object of offering 24-hour telephone and airmail service. For parts that are no longer available, Tom will undertake to fabricate them or have them made, including such items as windshields, engine parts, suspension units, body panels, etc. Also in stock will be Italian accessories, as well as a line of Meade-made accessories. Special building will continue to be a big part of Tom's activities as well as "streetifying" competition cars and rebuilding damaged cars. About the latter, he envisions offering a rebuilding service, with return shipping, for damaged cars sent from abroad. A similar service for engine and gearbox rebuilding will be available. He's optimistic. It's been a lonely hard pull, and the meals weren't always regular. Now the breaks seem to be coming his way. "It is probably a good thing that I couldn't buy everything I needed in the early days. That way, I learned how to do a lot of things myself, whether I wanted to or not." With that attitude, it is probably more accurate to say that Tom is making his own breaks.